My father, in his bachelor years, cultivated a half-dozen apple trees and dabbled in grafting experiments. In a flash, he had four children under the age of seven which made such hobbies seem, I'm sure, a vast and distant extravagance. The trees and children grew together. We spent many summer and fall days between those apple trees. We gorged on crabapples. We threw fallen apples at the shed and each other. We gathered crabapples for my mother to can in syrup and bake into pies. As the children grew, fewer apples were eaten, fewer pies were made and the apple trees became a tiny bit detested as their wild and unpruned branches became a grass cutting nightmare. Most people, my husband included, believe the only value crabapples have is as ammunition in childhood fights. I know their true value. Crabapples are tiny, tart, rosy apples which grow with wild abandon throughout this great city. The organization, Not Far From the Tree, brought crabapples back into my life after a long absence. After a pick I was able to consume crabapples with such gusto that I soon had that specific, familiar, long-missed stomachache that only tart little crabapples can cause. 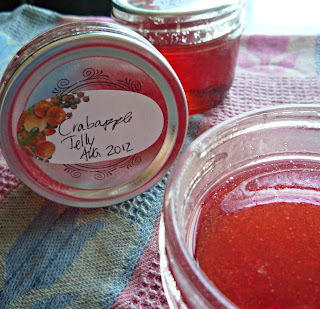 My @NFFTT haul was more than I could eat so I canned most of my crabapples into sparkling, jewel-toned jelly. Yes, crabapples make the perfect ammunition but there are many other options for this tart, unassuming apple. I've always wondered if those little things were edible! I'll have to set my hubby straight. Thanks for the info; your jelly looks gorgeous. I adore the jeweled jars of preserving. Just gorgeous!